Congratulations! You are our newest Elite Note Taker and we can't wait to see the rest of your notes. Upload them now for exclusive contests and prizes. Looks like your trial period for the role has ended. If you'd like to try again to become an Elite Note Taker, click here to restart the process. You're now on trial as an Elite Note Taker. Publish 5 approved documents to pass the trial. Movies about students may be ubiquitous, but not all on-screen students are academically inclined. From movies about smartypants students to those where college is a giant party, we wanted to take a closer look at some of the best and worst on-screen students. Find out who got top grades, who were the fighters, and who were classic slackers! Share this Image on Your Site! You’ve probably seen it in your classes; the smartest kids don’t always get the best grades. Conversely, the students that get the best grades might not be the smartest. The same is true in the movies. Looking at on-screen math, science, and tech students, we considered a student’s grades compared to how much intelligence the character portrayed. After ranking the movies and plotting these two coordinates visually, we found that average students don’t often become movie characters. Revenge of the Nerds: LLewis and Gilbert (Grades: 5, Intelligence: 2) The nerds get good grades, but they don’t break ground with advanced theorems. 21: Ben (Grades: 4, Intelligence: 4) Ben was a top MIT Math major, except for that one incomplete that he got after spending too much time playing blackjack. The Social Network: Mark (Grades: 2, Intelligence: 3.5): In 2004, The Harvard Crimson reported that Zuckerberg’s grades suffered while running his websites. Back to the Future: Marty (Grades: 1.5, Intelligence: 1) Marty was busy with band practice so he finished his science homework at the last minute by borrowing something from Doc’s lab. Proof: Catherine (Grades: -1, Intelligence: 4.5) Catherine was a math grad student, but was suspected of plagiarism as colleagues questioned if she was capable of developing an important mathematical proof. Good Will Hunting: Will (Grades: -4, Intelligence: 5) Will sets fire to his homework in Professor Lambeau’s office, but he still receives plenty of job offers, including one opportunity from the NSA. E.T. : Elliott (Grades: -4, Intelligence: 1) During science class, 10-year old Elliott releases all the frogs before they could be dissected, surely earning him a bad grade for the term. 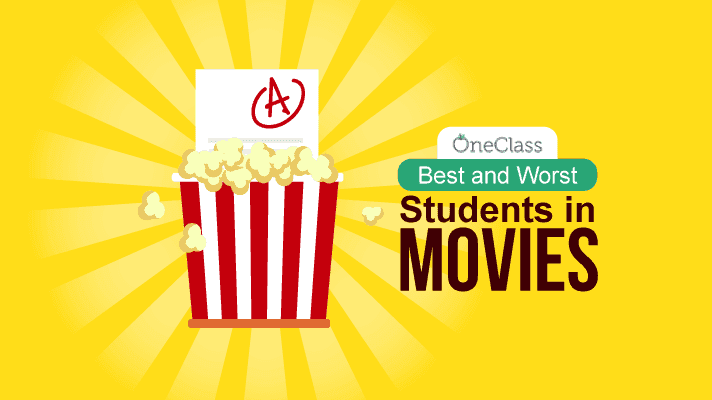 Some movies show students who’d benefit from additional resources that can help them get better grades. The movie Animal House has some of the top college slackers. When meeting with Dean Worner, the Deltas learn about their midterm GPA scores. Hoover earns a 1.6; Kroger earns a 1.2; Dorfman earns a 0.2; Day got an Incomplete in all courses; and Blutarsky earned a 0.0 GPA. In National Lampoon’s Van Wilder, the title character is a 7th year college senior who is seemingly earning an advanced degree in partying. In the movie Grease, the character Frenchy is a beauty school dropout who missed midterms and flunked shampoo. At OneClass, we think a lot about studying, including the best way to study, the best study tools, and if late-night cramming really works. This led us to consider the study habits of students in the movies. Bill & Ted’s Excellent Adventure: (Study Score: 9) The duo time travels for the sake of their history class, which shows significant commitment to getting a good grade. Legally Blonde: (Study Score: 8) Elle crams for the LSAT and scores a 179, which gets her accepted to Harvard Law School. The Waterboy: (Study Score: 7) Bobby, a 31-year old, passes the GED with a 97 percent, allowing him to play college football. The Great Debaters: (Study Score: 7) The debate team starts as underdogs and goes on to win the national championship. Dead Poets Society: (Study Score: 6) Students start studying in free time, hosting poetry and literature sessions in a cave near campus. Finding Forrester: (Study Score: 6) Jamal writes and rewrites, punching away on the keys of a typewriter. Freedom Writers: (Study Score: 5) At-risk students fight to keep grades up. Teen Wolf: (Study Score: 4) Being a wolf helps his sports game, but not his academics. The Breakfast Club: (Study Score: 3) Not much studying happens during Saturday detention. Mean Girls: (Study Score: 3) In the movie plot, studying doesn’t help your social life. However, for fans of the movie, there’s a class at Colorado College where you can study the film. Half Nelson: (Study Score: 2) Things go downhill in this teacher movie with an unlikely plot. American Pie: (Study Score: 1) There’s no studying in this high-school comedy. “If I was gonna give you a grade, I’d give you an A. If that sounds like a good grading policy to you, then taking a music class might be a way to outsmart your grades to get a better GPA. After all, one “A” from an easy class can increase that semester’s GPA by between 0.2 and 0.6 points. Not all schools are for humans, and not all students are in favor choosing classes such as psychology and chemistry. Instead, some movie schools have a supernatural focus. In X-Men, mutants can attend school at the X-Mansion, which is also known as Xavier’s School for Gifted Youngsters. In advance of the release of X-Men: Apocalypse, the movie studio produced a spoof ’80s style TV ad for the school that addressed the unique gifts of its students. In Harry Potter, the arrival of students at Hogwarts School of Witchcraft and Wizardry is the beginning of their magical training. Class subjects include Charms, Potions, Defense Against the Dark Arts, and of course, mandatory flying lessons. When Sully and Mike attend Monsters University, the scare majors get a taste of dorm life, and the movie’s study montage is a great look at what it takes to prepare for final exams. There’s an increasing number of older students on campus. According to the NCES, students aged 25 and older account for 29 percent of all college students for which age was known. There are a few notable examples of older students in the movies. The best older student was Billy Madison. He was up to 21 years older than classmates, returning to Grade 1 when he was 27 years old. He eventually graduates high school and enrolls in college to become a teacher. On the other hand, one of the worst older students was Thornton Melon in the movie Back to School. The 47-year old CEO gets into college because of a bribe and barely passed his final exams with all D’s and one A. Find out how using OneClass‘ online class notes and study guides can help you improve your GPA.